LONDON: The former Foreign Secretary, David Miliband, on Saturday suffered an upset defeat when his younger brother Ed Miliband was elected leader of the Labour Party in a closely contested election. He replaces Gordon Brown who resigned in May after the party’s humiliating general election defeat. 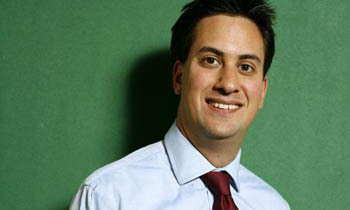 Mr. Ed Miliband (40) was Secretary of State for Energy and Climate Change in Mr. Brown’s Cabinet and is regarded on the Left of the party. He won by the narrowest of margins mostly on the strength of votes from the members of Labour-affiliated trade unions. Others in the fray were the former Education Secretary, Ed Balls; the former Health Secretary, Andy Burnham; and Diane Abbot, a left-wing MP. Mr. Miliband vowed to “unite” the party and paid tribute to his brother saying he had “extraordinary respect” for him and “loved him”. “Today we draw a line under this contest and move forward united as a team,” he told the party’s annual conference in Manchester.